How about another delectable dessert using our Gluten-Free Prairie Oatmeal, along with our Gluten-Free Prairie Toasted Oat Flour? This skillet version of gluten-free oatmeal apple crisp is deliciously deceptive in its simplicity. The secret is cooking the apples in the skillet before you put the topping on it. Try it, and you won’t be sorry you did. Neither will anyone you share it with! 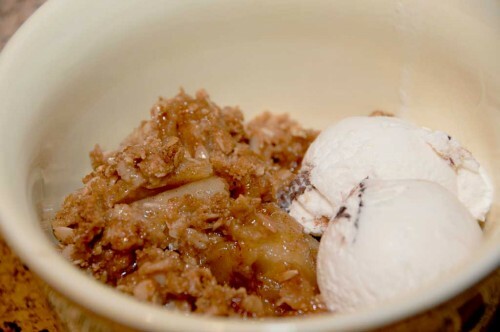 This skillet version of gluten-free oatmeal apple crisp is deliciously deceptive in its simplicity. Try it, and you won't be sorry you did. Neither will anyone you share it with! For the topping, combine oatmeal, flour, brown sugar, and melted butter in a bowl and set aside. For the filling, combine apples, sugar, corn starch, cinnamon, nutmeg, lemon juice, and salt in a bowl. Allow to sit for 10 minutes so juices start to release from the apples. In a large cast iron skillet, melt the butter. Do not let it burn. Add the filling mixture to the hot skillet and cook, turning often, until the apples are just fork tender, about 5 minutes. Remove the skillet from the heat and cover with the topping. Don’t pack it down! Place in the oven and cook for 10 minutes at 350. Turn the oven broiler on and broil for 2 minutes, checking to make sure it doesn’t burn.